Title [Baseball, City Series, Cubs and Sox players gathering on the field] [graphic]. 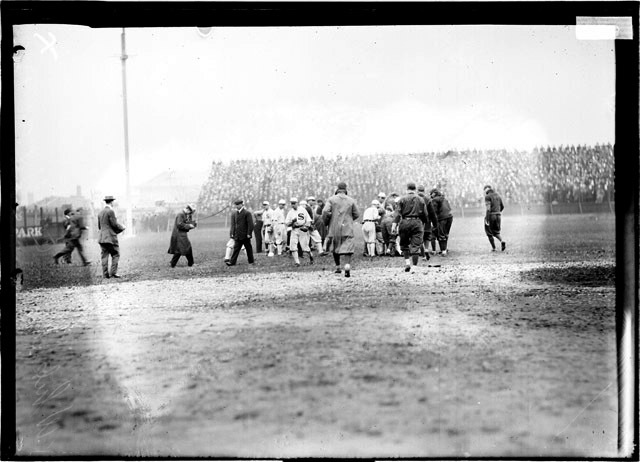 Collection summary View of baseball players, of the American League's Chicago White Sox and the National League's Chicago Cubs, standing in groups and walking on the field at Comiskey Park during a 1912 City Series. The stadium was located at 324 West 35th Street and bounded by West 34th Street, South Shield's Avenue (formerly Portland Avenue), and South Wentworth Avenue in the Armour Square community area of Chicago, Illinois. A photographer holding a camera and men wearing suits are standing and walking near the players on the left side of the image. Baseball fans Illinois Chicago 1910-1919.